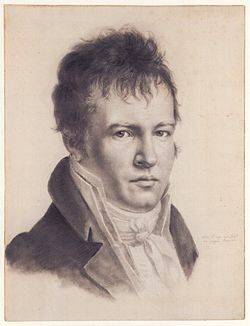 Alexander von Humboldt‘s visit to Mexico began in Acapulco on March 22, 1803, and lasted for almost a year. (He left Mexico via Veracruz for the USA on March 7, 1804.) In his year in Mexico, Humboldt had been incredibly busy. He had measured, recorded, observed and written about anything and everything, with remarkable industry and accuracy. He had climbed mountains, burned his boots on active volcanoes, descended into mines, recorded geographical coordinates, and collected numerous specimens and antiquities. Humboldt’s Political Essay on the Kingdom of New Spain was the first systematic scientific description of the New World. It appeared in 1811, and marked the birth of modern geography in Mexico. His figures and ideas were used and quoted by writers for many many years. Humboldt had also drawn a large number of maps, drawings and sketches and it can rightly be claimed that the modern era of Mexican map-making began with Alexander von Humboldt, and was then developed further later in the 19th century by cartographers suc h as Antonio García Cubas. The map above shows the route followed by Humboldt during his time in Mexico. The map comes from the book La obra de Alexander von Humboldt en México by Rayfred Lionel Stevens-Middleton (Mexico D.F. : Instituto Panamericano de Geografía e Historía, 1956). This hard-to-find work is a comprehensive account of Humboldt’s time in Mexico and of his significance for the development of what the author refers to as “modern geography”. 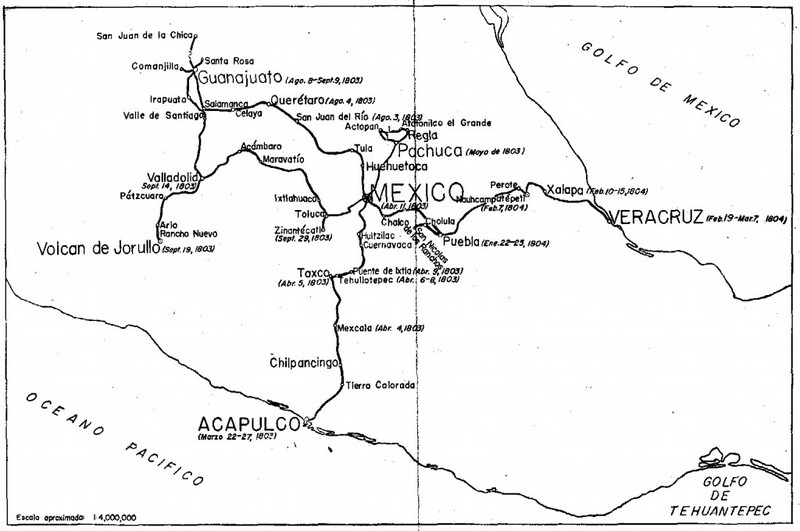 The map of Humboldt’s route in Mexico includes his various side trips such as those to Jorullo Volcano and Santa María Regla. Humboldt was keen to see Jorullo Volcano, since it was a rare example of a brand new volcano, one of only a handful of volcanoes that have emerged on land anywhere in the world in historic times. Jorullo first erupted on 29 September 1759 and activity continued for 15 years until 1774. Two centuries later, and about 80 km (50 miles) away, Paricutín Volcano burst into action for the first time, in a farmer’s field in 1943. Note: this post was first published on May 7, 2012.